Cartoon Xonix is a very successful new remake of the all-time classic Xonix/QIX game. In this one you get to drive a funny little train around the game field. Your goal is to save your favourite cartoon heroes who were trapped behind a magic wall by a mean Warlock. His sly servants will try to get in your way and stop you. 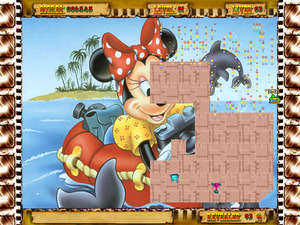 Cartoon Xonix 1.0 is a shareware program and can be used as a demo to try the software until the free trial period has ended. A full version of the program is available after the trial period ends. For security reasons, you should also check out the Cartoon Xonix download at LO4D.com which includes virus and malware tests. Additional screenshots of this application download may be available, too. Cartoon Xonix has a presence on social networks.